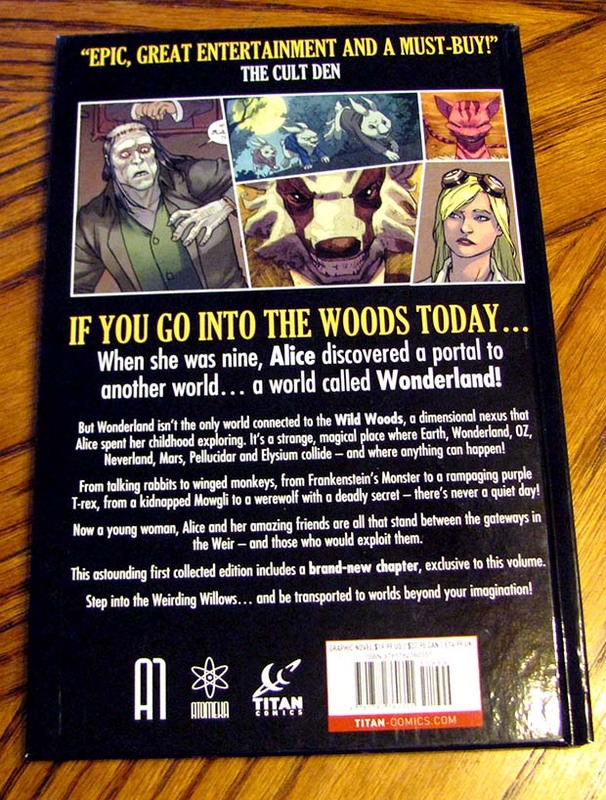 The Weirding Willows is an odd, yet refreshing new take on the classic fantasy worlds of Oz, Neverland, Elysium. Mars, and Pellucidar, if they were all blended together on planet Earth. I really like how the writer Dave Elliott infuses a more mature, dark tone into all of these colorful, whimsical characters. It reads like the nightmares you might have experienced as a child after your parents read to you some old, twisted fairy tale before bed like Hansel & Gretel, or The Girl Without Hands. 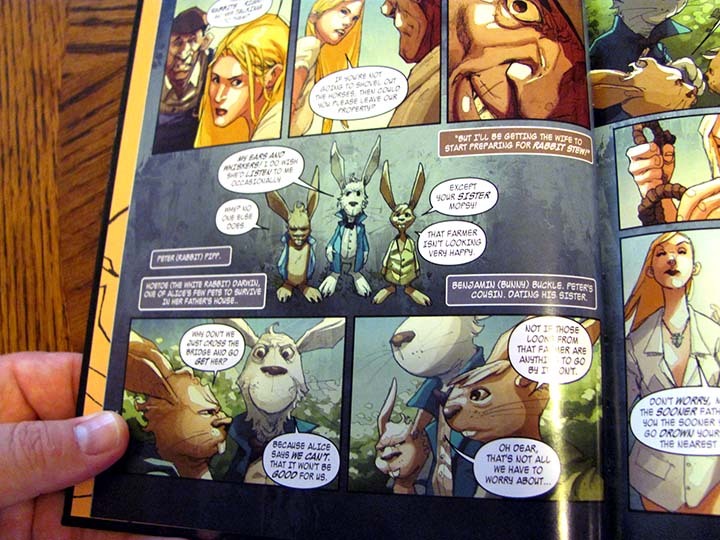 The three rabbits(Peter, Hoetoe: The White Rabbitt & Benjamin the Bunny) are my favorite characters in the The Weirding Willows saga so far. Their little gang is equal measures Goodfellas, and The Dark Crystal. The protagonist of the story, Alice Moreau(yes, that Alice! ), lives with her scientist father, Doctor Philippe Moreau(yes, that Doctor Moreau!) who has taken care of her by himself since her mother’s disappearance when she was only 5. One day when she’s 9 years old, Alice wanders off into the nearby woods, following her white rabbit pet, Hoetoe. She would chase him down into the “rabbit” hole(literally and proverbially, and discover the fantastical world of Wonderland. Soon after returning home, she ventures out into the mysterious woods again, and discovers more “portals” to other magical worlds. All the while, sharing her amazing discoveries with her father who abruptly dismisses her as a child with an out of control imagination. Dave Elliott has done a brilliant job of re-imagining this classic character as a sort of “Indiana Jones” type of adventurer, and vastly expanding her universe by introducing all of these other well known fantasy worlds to her story. Other recognizable characters like Frankenstein’s Monster, The Jungle Book’s Mowgli, and Dr. Jekyll & Mr. Hyde are re-introduced to us along the way. 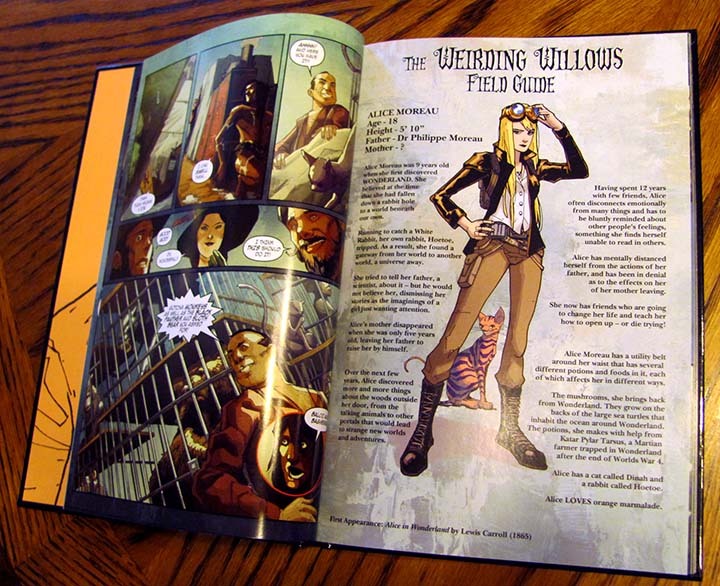 Each chapter also includes a handy Field Guide for each major character, giving the reader a quick description & bio, along with a mention of the first appearance, i.e. Alice Moreau: Alice in Wonderland by Lewis Carroll(1865). The artwork by Barnaby Bagenda, Sami Basri, and a stable of colorists is very well executed in a contemporary comics style, which helps to unify all of these “old worlds” into an edgier, more modern setting. 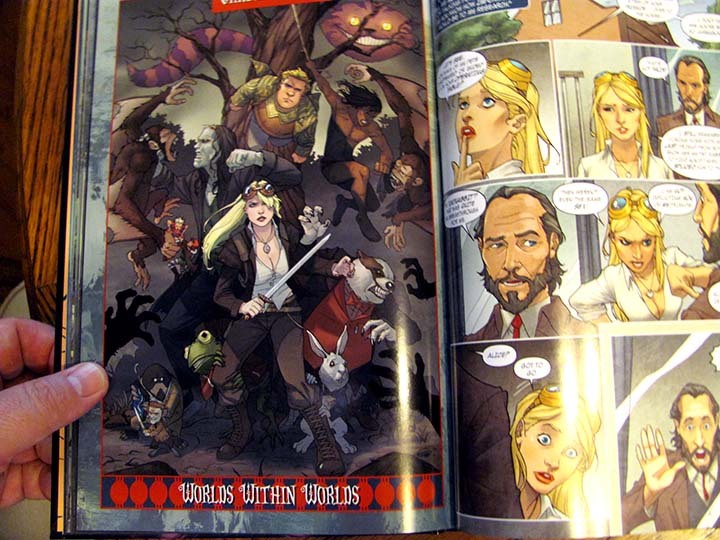 I highly recommend picking up The Weirding Willows Volume 1 when it hits store shelves on July 1st. 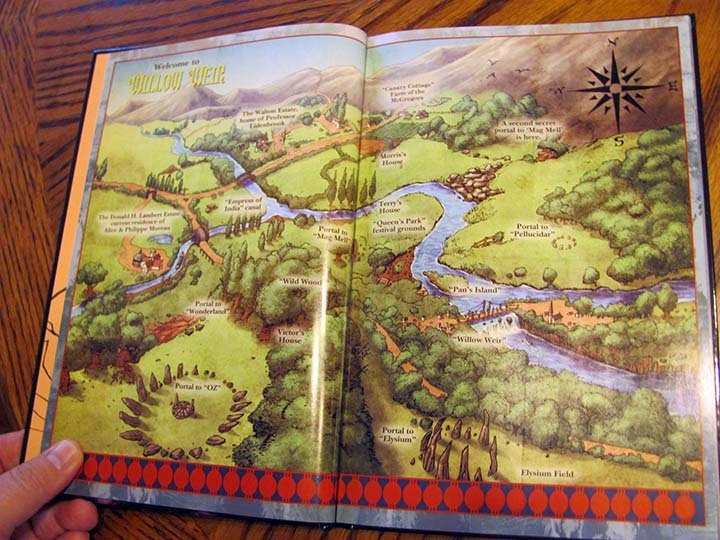 I think it would be a great gift for a younger reader/teenage plus, or anyone who’s interested in learning more about the classic fairy tales that inspired this book! 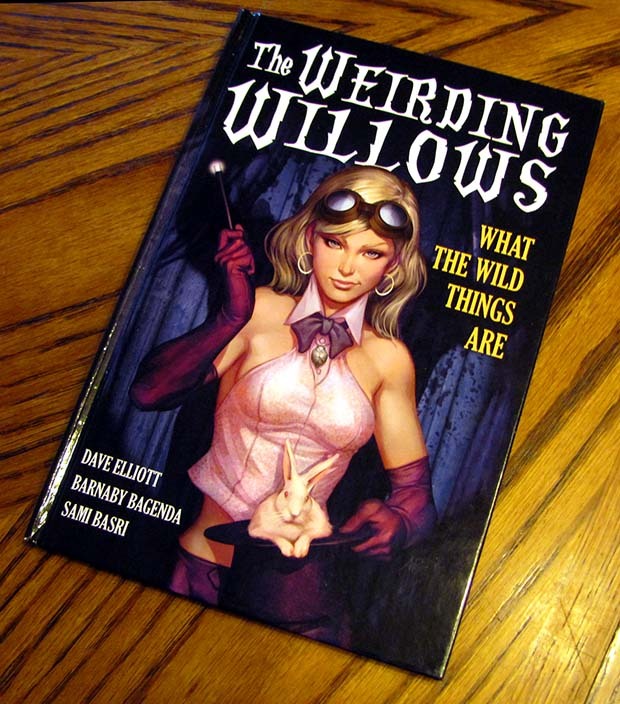 The Weirding Willows Volume 1: What the Wild Things Are is published by Atomeka/Titan Comics and can be ordered here.